WE ARE HERE!!! I feel so blessed to be writing this letter from the rain forest of PNG! We arrived in Port Moresby on September 1st and were thrilled that Jerry and Avoro Miri, our future co-workers in Ihu, were among those there to meet us. It was a quick five days, buying supplies, getting a bank account and driver’s license, and planning with Jerry for the Ihu work. We were greatly helped by Pastor Tau and some folks from Shalom Baptist Church. It sure was terrific to see two young men from the church find us in the grocery store and offer to push the extra carts around just when Trina and I had filled two up! I would never have been able to drive around town myself if one of the men had not helped me learn the basic “rules of the road” right after I got my license. Newsflash: I did not have to pass any test to get my license. I did not even SEE a book describing driving regulations. 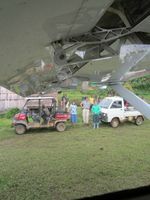 We had the special blessing of being in Port Moresby at the time the Wes Brown family was arriving for their survey trip, so we got to meet them at the airport and spend a night together before heading up to the bush. It has been awesome to see the fruit of the chronological teaching method. We are currently staying in Kotidanga in one of the TTMK guesthouse apartments. We are so grateful to have this place to stay, and want to mention a special thanks to PCC Campus Church and Landmark Independent Baptist Church for their generous gifts to this project. After a few weeks, our luggage all caught up with us, so we are very comfortable here. 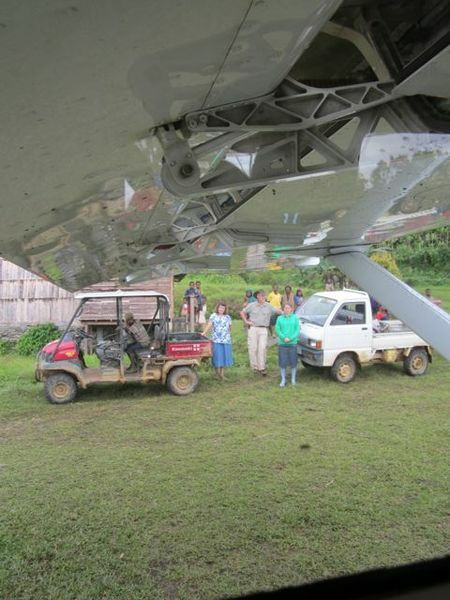 Everyone was very gracious, loaning us items until our own things could be flown up. Our Orientation/Pidgin class is taught by Missionary John Allen and held Monday-Thursday mornings. Friday mornings, we go to market to shop and to hear the Bible School students preach outdoors. In the afternoons, we look for chances to practice Pidgin and keep learning about functioning in our new country. The continuing work on the guesthouse has given me some great opportunities to become familiar with setting up solar power. This will be invaluable to me as I build our home in Ihu. And honestly, after being in class in the morning, it is “therapy” for me to be able to work on a project! Trina is glad to be in a “home” again, and has enjoyed figuring out how to cook with a combination of the market items we get and the canned and dry goods we brought up from Moresby. She is very happy that she could remember how to make bread without her Kitchen Aid Mixer! On Sundays, I have been going with John Allen and 3 of the Bible School students and their wives to the church plant in Ipaiyu. I have enjoyed the fellowship with them, and it has been awesome to see the fruit of the chronological teaching method. Two souls have come to Christ in these past few weeks! I have one very important prayer request to share with you all. Just over a week ago, Jerry’s wife Avoro had a partial mastectomy (cancer). This would definitely be considered a major surgery here, and the chances of a post-operative infection are high. Please pray for a quick and safe recovery, and that the necessary radiation treatment can be completed successfully. Pray also she, Jerry, and their two year old son, Lakobob, will soon be able to move into Ihu themselves. They will need to precede us there, as their housing and water tank will provide a safe place for us to stay as we build our home. We are eager to be on the coast, among the Orokolo, and know God will bring us there at exactly the right time. Thank you all for your prayers and support. We could not be here without you there!